If you need some cash while you’re on the go, taking a road trip, or on vacation, a gas station is a very convenient place to get it. While not all gas stations offer cash back, many do, but it can be challenging to find them. Even then, most of them have low maximum cash back amounts, and it’s best to know what that is — along with what cards they take and if they charge any fees — before driving out of your way to get to one. Almost all of them accept Visa, Mastercard, and Discover Debit, but a few don’t accept Discover. The majority also don’t have fees associated with cash back, but a couple do, and some have minimum purchase requirements. Looking all this up can be confusing and less than doable while out on the road, though. That’s why we’ve done the work for you! Here’s the list of gas stations that do cash back at the register on debit card purchases, along with the limits and fees, if any. All of our information was verified through phone calls to customer service representatives. 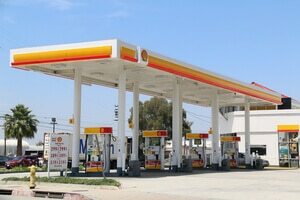 Note that policies on cash back at gas stations can vary from store to store, especially for gas stations that have independently owned and operated franchises. In these cases, it’s a good idea to call ahead and ask whether a specific gas station offers cash back. Accepted payment methods for getting cash back: Debit card. 7-Eleven accepts Visa, Mastercard, and Discover Debit. Learn more in our article: Does 7-Eleven Do Cash Back? Note: Most stores are independently owned and operated so policies may vary. Accepted payment methods for getting cash back: Debit card. ampm accepts Visa, Mastercard, and Discover Debit. Fees: No fee but a minimum purchase of $2.50 is required to receive cash back. Accepted payment methods for getting cash back: Debit card. BP accepts Visa, Mastercard, and Discover Debit. Accepted payment methods for getting cash back: Debit card. Casey’s accepts Visa, Mastercard, and Discover Debit. Accepted payment methods for getting cash back: Debit card. Circle K accepts Visa, Mastercard, and Discover Debit. Accepted payment methods for getting cash back: Debit card. Conoco accepts Visa, Mastercard, and Discover Debit. Accepted payment methods for getting cash back: Debit card. ExxonMobil accepts Visa, Mastercard, and Discover Debit. Accepted payment methods for getting cash back: Debit card. Hy-Vee accepts Visa, Mastercard, and Discover Debit. Accepted payment methods for getting cash back: Debit card. Kum & Go accepts Visa, Mastercard, and Discover Debit. Accepted payment methods for getting cash back: Debit card. Kwik Fill accepts Visa, Mastercard, and Discover Debit. Accepted payment methods for getting cash back: Debit card. Kwik Trip and Kwik Star accept Visa, Mastercard, and Discover Debit. Accepted payment methods for getting cash back: Debit card. Marathon accepts Visa and Mastercard. Accepted payment methods for getting cash back: Debit card. Phillips 66 accepts Visa, Mastercard, and Discover Debit. Fees: None, but you must spend at least $3 to get cash back. Accepted payment methods for getting cash back: Debit card. Shell accepts Visa, Mastercard, and Discover Debit. A few locations may also accept personal checks for cash back. Accepted payment methods for getting cash back: Debit card. Valero accepts Visa, Mastercard, and Discover Debit. Accepted payment methods for getting cash back: Debit card. Weis Markets accepts Visa, Mastercard, and Discover Debit. If your nearby gas station is on this list of ones that don’t offer cash back, check out our article: Nearby Stores That Give Cash Back. Those are the gas stations that do cash back and the ones that don’t. While not all gas stations offer cash back, there are plenty of regional and national gas stations that will allow cash back at the register with a debit card purchase. They all accept Visa and Mastercard, and many also accept the Discover Debit card.